August is SMA Awareness Month and families and friends around the country are joining together to help promote awareness of this devastating disease so that we can one day see a world where SMA is treatable and curable. Click HERE to donate in Annie's memory! 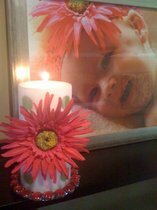 Please join us in honoring the warriors and angels of SMA... support families & friends by lighting a candle at sunset to remember those SMA Angels who have lost their battle with SMA and to honor those SMA Warriors who are fighting everyday. As this event continues to grow we hope to bring awareness about SMA and also unity to the families living with it as we join spreading the light of our candles around the world. We hope you will join us by lighting your candle for SMA families everywhere. Just light a candle from wherever you are at this time. **Be sure to choose "Type of Donation: In Memory of"
Thank You for Visiting & Helping Us Raise SMA Awareness!